When you have questions, we have answers—about all aspects of care for your companion. Whether you’re thinking about getting pet insurance, debating whether to revaccinate or trying to make sure your pet is eating a healthy diet, Rockledge Veterinary Clinic offers a wide range of information and educational resources to help you make the best decisions. Our veterinarians and staff are always happy to take the time to answer your questions. Check out the articles at left on insurance, allergies, nutrition and more. Browse Resources. Our library has links to articles on everything from acupuncture to parasite prevention, training and vaccinations and titers. Read our newsletter with tips on pet care, training, and more, along with “Ask a Vet” and information on adoptable pets. 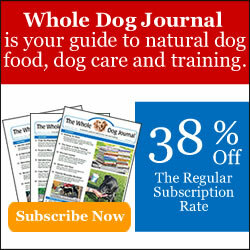 We recommend Whole Dog Journal to owners interested in an all-natural approach to dog food, dog care and dog training: "Whole Dog Journal guides you step-by-step through the latest natural dog health remedies and positive dog training tips and techniques that are proven safe, gentle, and effective." They are currently offering 38% off the subscription rate, if you are interested click below.